Taken from the road leading to the harbour. Looking over the harbour - what a view! Ballintoy Harbour lies at the end of the twisty and dramatic Harbour Road which offers good views along the rugged 'Causeway Coast' in Northern Ireland. To say it is a landscape photographers dream would be an understatement. The first area of interest to the landscape photographer is on the approach to the harbour itself. The landscape photographs in the gallery above were taken from this road. 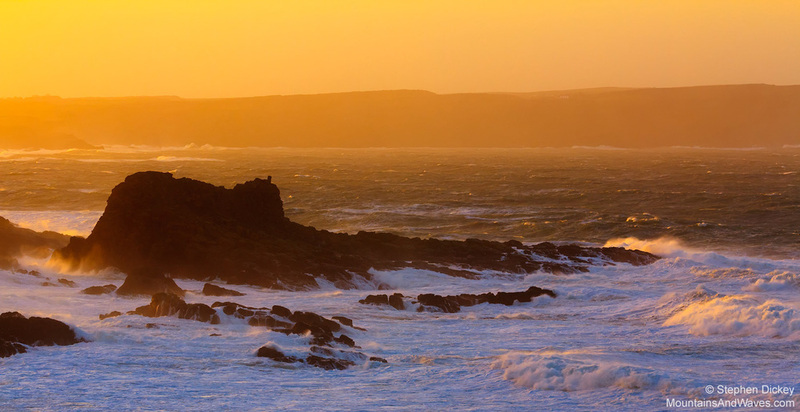 I used a long telephone lens to capture the dramatic scene in the first photograph, which shows big waves crashing into the rocks at sunset. Those are the cliffs close to the Giant's Causeway which you see in the background. As well as plenty of telephoto opportunities, if you are willing to walk away from the road a little then you will find plenty of places in which you can use your wider angle lenses. Please be respectful of the local landowners and livestock in the area. Can you spot the elephant!? This colourful cliffs line the beach to the south. You will see the best colours behind this arch if you shoot at sunset. Follow the path to the west and you will immediately see some dramatic rock structures on your right hand side, as well as some long grass. On a windy day you might want to try and use a long exposure to capture the movement in these grasses - what a dramatic foreground for your landscape photograph! Keep heading west beyond this area and you will cross some open ground. It can be very muddy here and there are some stiles to climb over. Eventually you will start to climb up a shallow hill with cliffs on your left and more interesting rock structures to your right. Keep going and you will see the little bay where the landscape photographs above were taken. It is quite a dramatic experience as you walk over the crest of the hill and well worth the 10-15 minute walk from the harbour. In my opinion the best photographic opportunites exist at high tide. 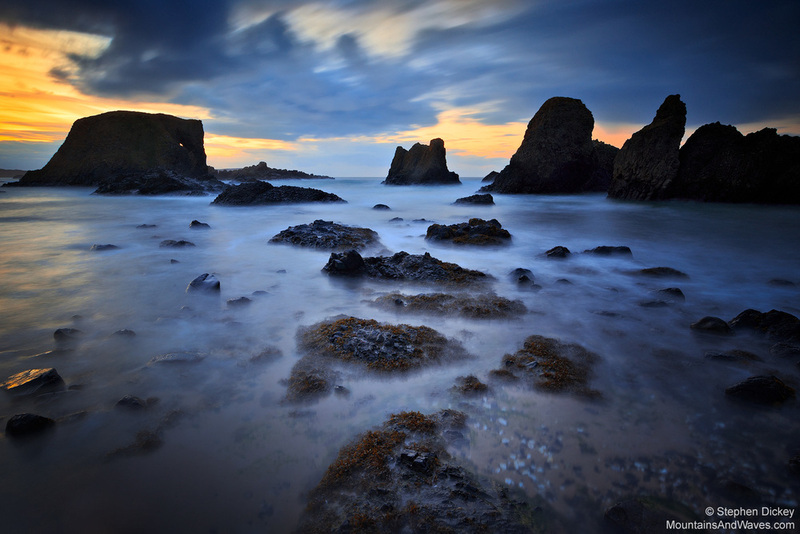 Low tide exposes a lot of rocks in the bay which can complicate compositions substantially. The mood and look of the bay varies dramatically based on the light and tidal conditions, as can be seen by my own Ballintoy landscape photographs in the gallery above. At sunset you will struggle to maintain shadow detail in the rocks as the sun will be directly behind them. I would recommend using soft-edged graduated neutral density filters and bracketed exposures to help combat this problem. The water swirls and twists around seaweed covered rocks in the bay, so experiement with shutter speed to try and capture this movement. If you keep walking west you will eventually end up on the beautiful beach at White Park Bay. If you are spending a few hours shooting then the extra walk is worth it, but come back to the elephant and arch for sunset. The more adventurous landscape photographer can clamber up onto the rocks around this bay - not something I have tried myself, so please be careful if you do. Sheep Island in the midground and Rathlin Island in the far background. The moon rising above Sheep Island. There are some beautifully coloured grasses to use in your foregrounds. Landscape photographers who don't like to walk as far should walk back up the hill to the east of the car-park and at the first bend follow the track down to the sea. The waves really crash into the rocks here so if you are looking for a dramatic landscape photograph, you have found the right place. Use all of your available focal lengths here; wide angles can take in foreground rocks, coastal cliffs and distant islands, whereas telephoto lenses can be used to isolate these elements. Sheep Island lies out to the east and has a very distinctive shape, it almost looks like someone has stuck two small islands together. You can see it in all 3 of my landscape photographs in the gallery above. The larger island beyond Sheep Island is called Rathlin Island - birdwatchers should take a day trip here using the ferry in Ballycastle! There are also some landscape photography opportunites as you drive along Harbour Road before reaching the harbour itself. You will see a beautiful white church which is very frequently photographed, and you can walk east from the church along the white clifftops towards Carrick-a-Rede Ropebridge.